The Mad Bluebird is an adult male Eastern Bluebird (Sialia Sialia) which nested in my backyard for about two seasons. I photographed him and his mate during the nesting seasons and also in the winter, where they and their offspring used the nesting log for a roost at night to keep warm. 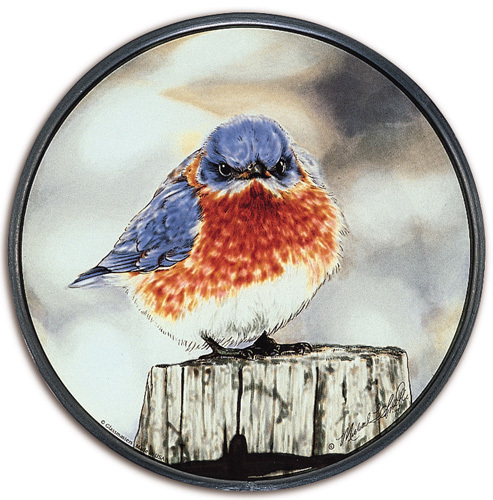 The photograph first appeared on the cover of a National Geographic brochure where it generated such interest that thousands of prints have been sold, perhaps making The Mad Bluebird the most recognized and loved bird image available today. Now, assisted by the world renowned artistry of Glassmasters, I am happy to present The Mad Bluebird for the first time in brilliant, kiln-fired stained glass. Painstakingly produced in fadeless enamels, the image that has captured the world conveys his charming expression from the real world of "life in the wild" into your lives.